Brand new DELUXE edition of the deleted acoustic album from 2011! This second edition now comes in deluxe 8-panel digipak and features a total of 7 never before available, exclusive Live-Tracks! Beyond the Woods is a collection of 9 of the best Trobar de Morte songs, re-recorded in the studio in acoustic versions, plus four new songs in acoustic mood too. Released in 2011, this album marks the most extended recording sessions in the career of Trobar de Morte, resulting in a superb, crystalline deluxe high fi studio production: A vast acoustic recording on highest level of performance defined by ultra-detailed arrangements on the wings of pure medieval, classic emotions, melodies and sounds. 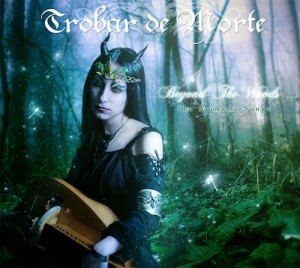 Trobar de Morte play Hurdy Gurdy, Bells, Flutes, Tambourines, Drums, Darbuka, Bass, Bagpipes, Whisles, Spanish classic Guitars, Bouzouki, Violins, Celtic Harp.. Trobar de Morte is one of the leading and best dark folk/neoclassical bands in Europe today, with a solid and huge fanbase worldwide. A delicate group of sublime art.